Land of rolling hills, yellow mustard fields, handsome limestone abbeys and castles, and picturesque vineyards, Burgundy is also one of France's top culinary regions, and is a popular places for foreigners to take cooking courses. Burgundy's golden age ran from the 11th to the 15th century. 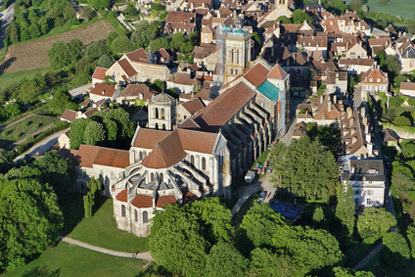 During that period, great monasteries were built, among which the abbeys of Vézelay and Fontenay, now protected by the UNESCO as World Heritage Sites. 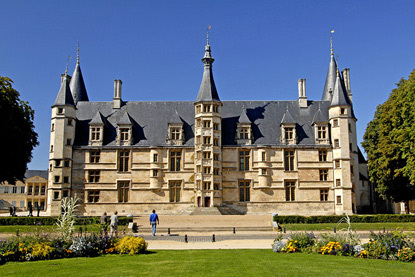 Cluny Abbey, the grandest and richest of them all, was once the largest Christian edifice in the world, and a leading voice for monastic life throughout Europe. Covering a land area of 31,582 km², Burgundy is slightly bigger than Belgium and just a bit smaller than the U.S. state of Maryland, though with only 1.6 million inhabitants Burgundy is much more sparsely populated than either. Its population density (51 inhab./km²) is in fact the lowest in continental France after the Limousin (and equal to that of Auvergne and Champagne-Ardenne). 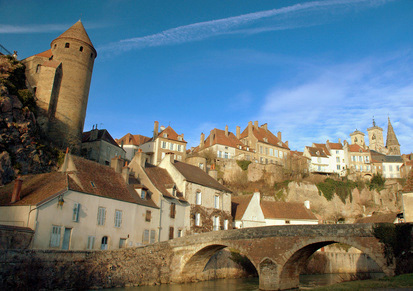 Famous companies from Burgundy include the Laboratoires Vendôme, famous for its soap products Le Petit Marseillais, and the Groupe SEB (Société d'Emboutissage de Bourgogne), owner of such brands as Krups, Moulinex, Rowenta, and Tefal. Famous people from Burgundy include (chronologically): the naturalist and mathematician Georges Louis Leclerc, Count of Buffon, the writer and politician Alphonse de Lamartine, the lexicographer and encyclopaedist Pierre Larousse, the engineer an architect Gustave Eiffel, the novelist and performer Colette. The region owes its name to the Burgunds, a Germanic tribe descended from Denmark that overran the Roman Empire and created their own kingdom in the southeast of Gaul in the 5th century. The Burgundian Kingdom actually occupied the regions of Dauphiné and Savoy and was only related in name to the Dijon-based Duchy of Burgundy established by the Franks in the the 9th century. In the 14th and 15th centuries, the Duchy of Burgundy, ruled by the House of Valois (cousins of the Kings of France), would markedly expand its territory through a series of political marriages. The County of Flanders, then Hainaut, Holland, Brabant, Luxembourg, and eventually the whole of the Low Countries came this way under Burgundian dominion. 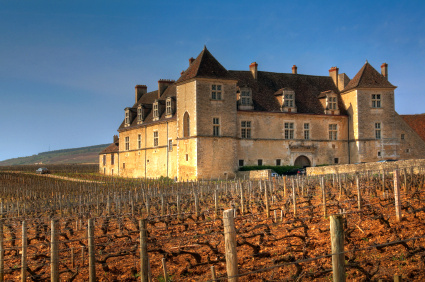 Burgundy was then one of the richest states in Europe, along with the Venetian Republic. In the Hundred Years' War (1337-1453) between England and France, Burgundy sided with the English in the hope of dividing France between themselves. In 1430, Joan of Arc was captured by Burgundian troops and sold to their English allies to be executed in Rouen. Between 1467 and 1477, Charles the Bold would attempt to reunify the old Carolingian Lotharingia by annexing Champagne, Lorraine, Alsace. If he succeeded, Burgundy could become a kingdom and perhaps even overtake the Kingdom of France, weakened by the Hundred Years' War. His death at the siege of Nancy in 1477 ended the Burgundian expansion. His only daughter, Mary, married Maximilian I of Habsburg, Holy Roman Emperor. Burgundy had now passed in Habsburgian hands, and their descendants would rule over half of Western and Central Europe. 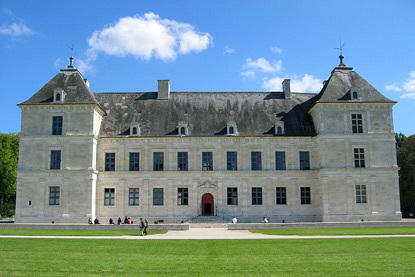 Ancy-le-Franc was designed by Sebastiano Serlio, who also worked on Fontainebleau, and constructed in 1544-1550. 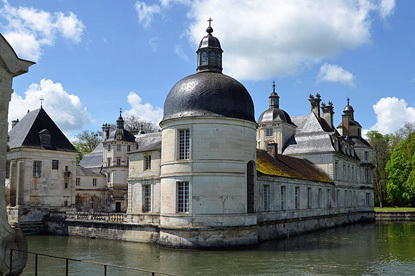 It is one of the sites where the Italian Renaissance was introduced to France. Tanlay is a Renaissance château erected and expanded between 1550 and 1650. The castle is renowned for its gallery painted in trompe l'oeil and for its frescoes. Noyers is a medieval village fortified with ramparts and brimming with quaint, skewed, half-timbered houses. 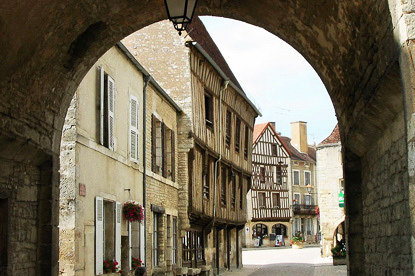 It is listed as one of the most beautiful villages of France. This former Benedictine and Cluniac monastery is a masterpiece of Burgundian Romanesque art and architecture. It has been listed as a World Heritage Site since 1979. 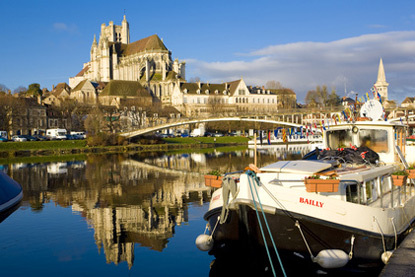 Auxerre has been a town since Roman times. It produces the world-famous Chablis wine. Of interest are the remarkable stained glass windows of its cathedral and the mural paintings of the Abbey of Saint-Germain, the most ancient of their kind in France. Nevers is the historical capital of the Nivernais. Two Duchesses of Nevers became Queen of Poland. 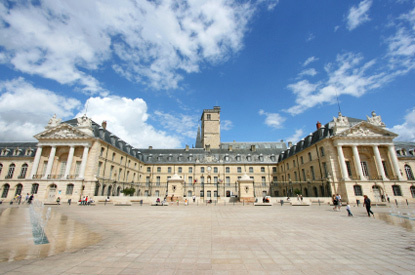 The Renaissance ducal palace is the star attraction along with the cathedral. Dijon is the historical capital of Burgundy and was one of the great European centres of art, learning and science in the late Middle Ages. The city is famous for its mustard, its gingerbread, as well as the Kir and Crème de cassis liqueurs. Founded in 1443 as a hospital for the poor and needy, the Hospices de Beaune is now a museum. 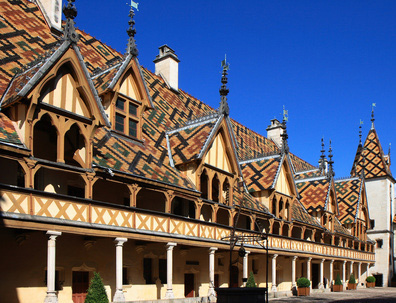 Polychrome glazed-tile roof has become a symbol of Burgundy. 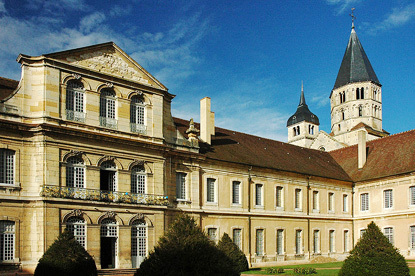 Founded by Bernard of Clairvaux in 1118, Fontenay is one of the oldest and most complete Cistercian abbeys in Europe. Semur-en-Auxois is a picturesque medieval town founded on a pink granite outcrop and dominated by the massive round towers of its city walls. 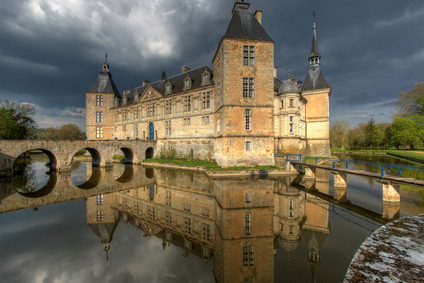 A grand Renaissance castle that was the family home of the MacMahon, including Patrice, 1st Duke of Magenta, who was the first president of the Third French Republic. 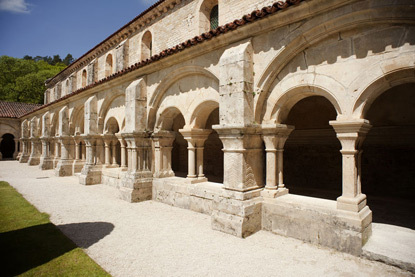 Founded in 910, Cluny Abbey was the largest religious edifice in the West in medieval times, and perhaps the most influential Benedictine monasteries in Europe.